I know that it's been a while since I posted anything, but as I mentioned in the last entry, it's the busy time of year here with maintanence on the boat and fishing and all the other spring/summer things that have to be done while the weather cooperates. Spring has been beautiful this year thus far, with lots of sun and a little too much heat. I hope we don't have another hot, dry summer again. We really need the rain to keep everything in balance. I was trolling for King Salmon the other day with relatively little success. I'm like the vitamins so far- one a day, which isn't a very good average. At this moment I'm going in the hole fishing, but hopefully that will turn around soon. I ran across Icy Straits to fish Homeshore last week. 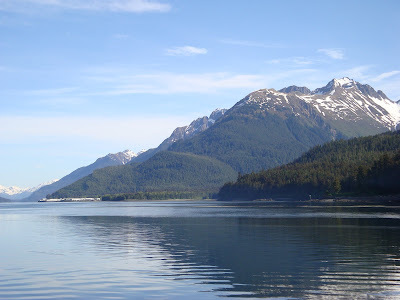 Historically the kings run up that side of the Straits on their way to the Taku or Chilkoot or Chilkat Rivers. I'm not sure how well the wild runs are doing. I know a lot of the fish we catch now are hatchery fish. The commercial fishermen are assessed a three percent tax to pay for the hatcheries which I don't mind paying,but a good bit of the fish they raise are feeding the sealions. More needs to be done as far as curbing the explosive sealion population. Right now they are protected by law and they have no fear of humans. What the animal rights groups either don't know or don't want to talk about is the amount of fish each one consumes every day. It's staggering- hundreds of pounds per sea lion per day. Multiply that by thousands of sea lions and it's no wonder that the salmon are getting harder to find every year. Unfortunately, like so many other things the feds are involved in, they won't take action to correct the situation until it's become a disaster. Anyway, back to the topic at hand. From Homeshore I worked my way on up into Excursion Inlet. There is a cannery there that processes salmon. It's quite a sprawling complex visible in the second picture. It used to be XIP, but I think Ocean Beauty bought it. Years ago there was a second cannery at the head of the inlet, I'm not sure but it runs in my mind it was owned by Pacific American Fisheries. Back before Alaska became a state there were fish traps at most of the canneries. Apparently they were incredibly efficient and almost wiped out the salmon fishery. Once Alaska became a state, they were outlawed. In talking with some of the long time residents here I discovered that the site where the cannery is now served as a prisoner of war camp for the German prisoners. 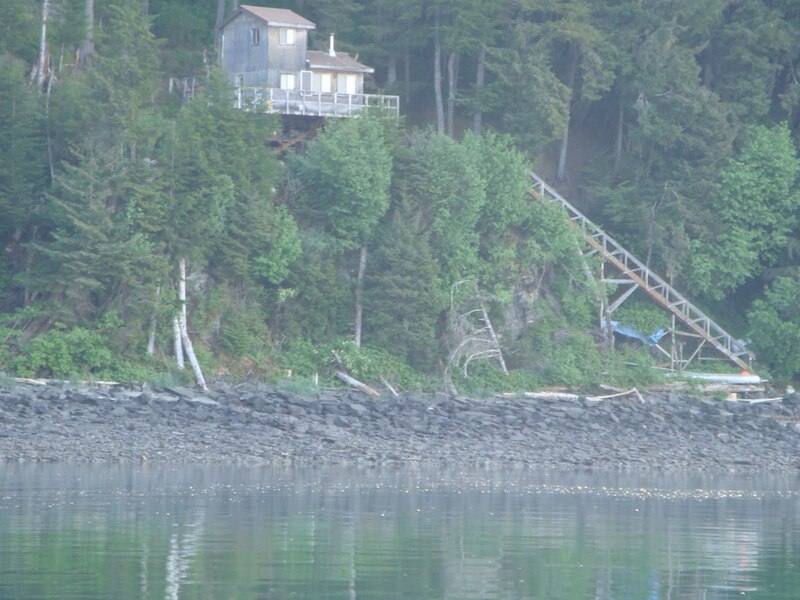 One of the Hoonah residents said that when he was a boy he and some of his friends would go to a hill overlooking the camp and toss rocks down at the prisoners. 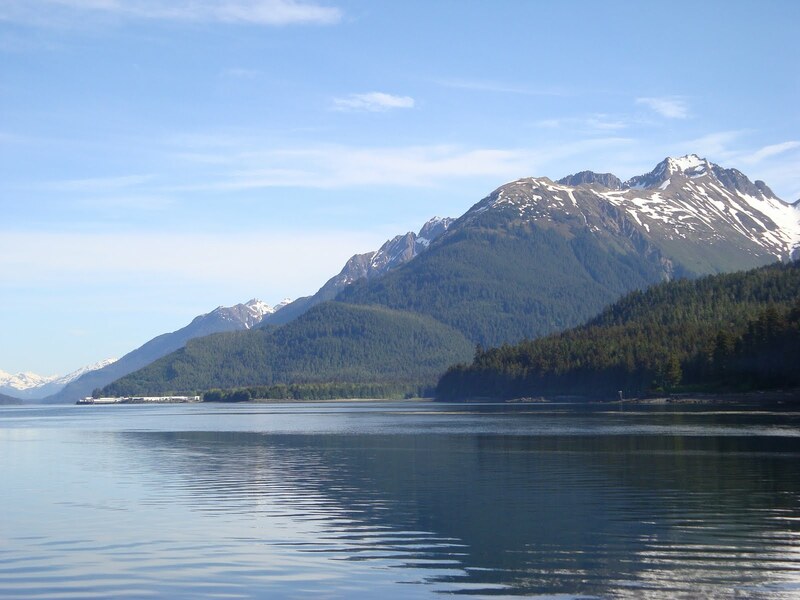 Like so many of the bays and inlets around here, the mountains seem to rise right out of the water. Right up against the beach in a lot of places the water will be 100 feet deep or more. With such steep terrain, there aren't a lot of suitable sites on which to build. However, a few hearty souls have overcome the problem by picking whatever available flat spot they can find and cantalevering out from the mountain. Personally, I wouldn't care to do that. 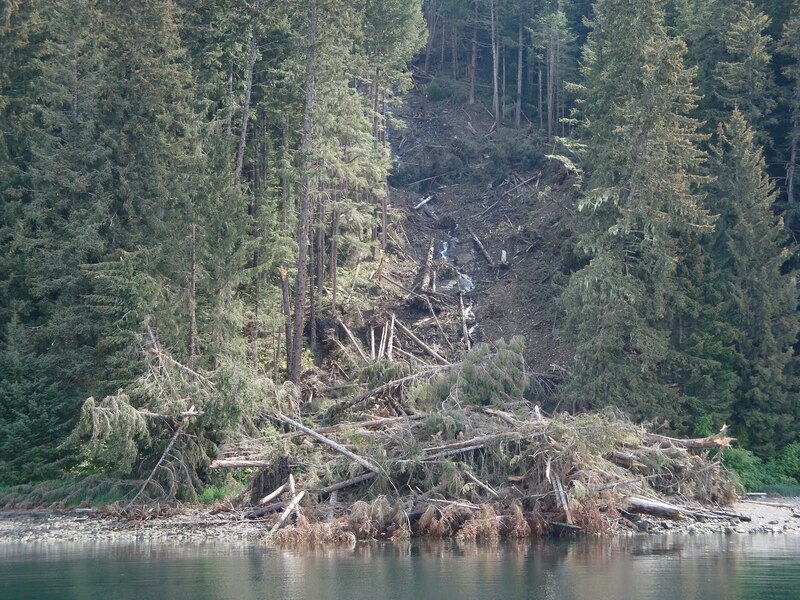 As you can see from the top picture, rock slides are always a possibility if you build on steep terrain. Fortunately, there were no homes at this location when the land decided to let loose. Excursion Inlet, like so many other formerly remote locations in the state now hosts two lodges. Huge complexes that house hundreds of fishermen during the season and unleash them on the surrounding waters. One lodge run by a fellow named Doc Warner sends out groups of four fishermen to a skiff to fan out around Icy Straits. They descend on the area like misquitos on bare skin and can be just as annoying. I wouldn't mind so much if there weren't so many of them. At any given time I have to dodge dozens of skiffs while I'm trying to make a pass down the shoreline. I know that times have changed and things will never be as they once were, but it sure is hard to take. For all you mothers who may be reading this - Happy Mothers Day! For those of you who aren't mothers, I hope you have a good day too. I had a rather interesting situation happen today. Fortunately it's not very common place, but I start to wonder if I'm not suffering from Brother Gary Syndrome. 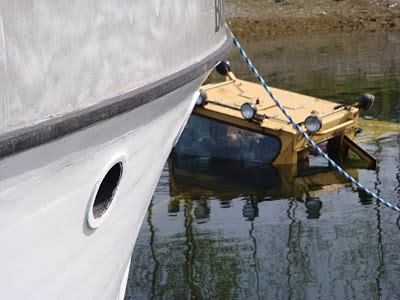 He's the fellow on the farm who had the most unfortunate luck when it came to boats. As I mentioned in the book, one time I came out to the point and his skiff was perched squarely on top of a reef. Another time he ran his boat up onto a log raft. His misadventures at the farm were legendary. We awoke every day wondering what new mishap he would be involved in. In all fairness to myself, I have to say that what happened today was totally out of my hands. Those of you who know me know that I was in a plane accident in 2000 involving crashing into the water. I had nothing to do with that either. As I mentioned in the last blog, I had the boat hauled out of the water to do routine maintanence- changing the zincs, painting the bottom ect. 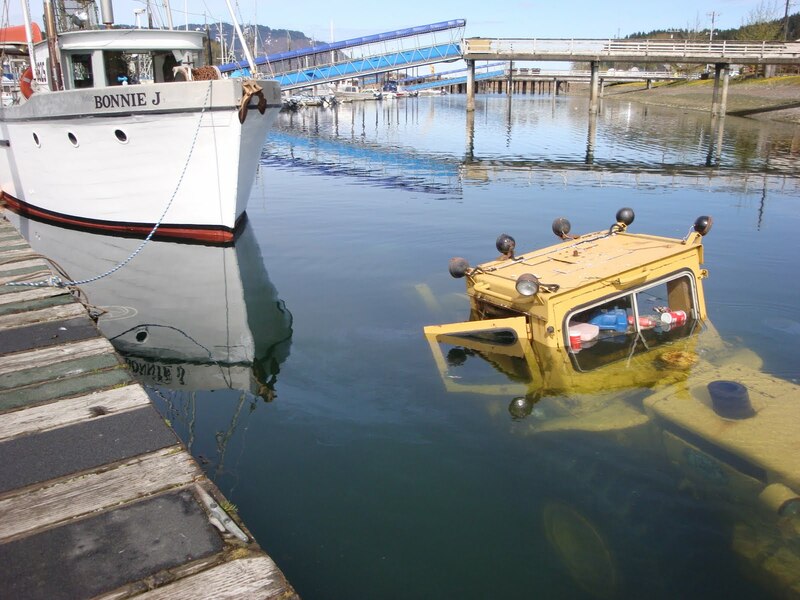 Well, I went down this morning to launch it back into the water. Keep in mind, this isn't something I can just attatch a trailer to my truck and back it down the ramp. 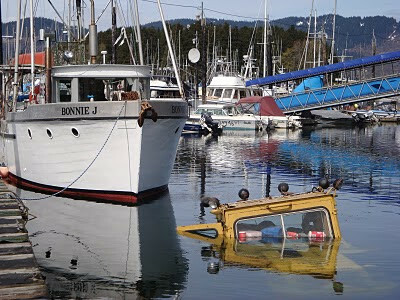 The Bonnie J weighed 20,000 pounds when it was first built, back before all the extra stuff was added- gurdies, leads, hayracks, stove, electronics and of course all the junk it takes just to go fishing. Add to that the added weight of water soaked wood and we can add an extra few tons I suppose. As a result it has to be hauled out using a hydraulic trailer built for that purpose and a loader or other piece of heavy equipment to move the whole mess around. Getting hauled out is always a nerve wracking situation to me, so I'm always happy when the work is all done and I'm back in the water. Well, today things didn't go so well. While Gregg, the driver of the loader, was driving the trailer down the ramp, the engine on the loader quit. With no power there were no brakes, so the ten plus ton boat, the trailer it was sitting on and the loader all went careening down the ramp and into the water. The boat smacked the float and knocked it several feet into the air and as you can see, the loader didn't stop until the cab was almost submerged. Fortunately no one was hurt, but the loader is going to take some time to fix, and the Bonnie J sustained some damage on the lower starboard side near the stern. Hopefully I can get it fixed without too much hassle and get out fishing this week. I never paid a whole lot of attention in Science class when I was in school, and I was certainly never smart enough to take a physics class, but undeniably, the laws of physics are at play here. A wooden boat floats much better than a steel loader. 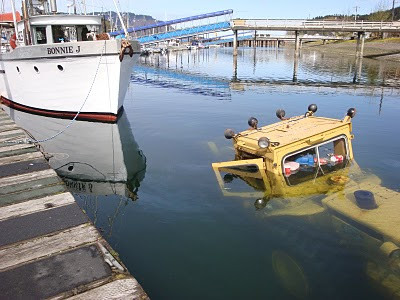 Even if it had a propeller on the rear and trolling poles it wouldn't float well. I guess that's why the marine architetcs don't design boats that even remotely resemble loaders. The busy season is upon us here in Alaska so it's going to be increasingly difficult to be able to keep up on the blog entries for awhile. The only reason I'm able to do it now is because it's raining outside. I've got the boat out of the water to do my annual maintanence and I've been painting it while the weather was good. It wasn't supposed to rain today- only a 20% chance of rain according to the forecast, but we do live in a rain forest and of course I'm using latex paint which is water soluble- go figure. If I wasn't trying to paint it would probably be sunny and dry as a desert. I can't really complain too much though. It has been pretty good weather-wise up until today, and so far no bugs. Hallelujah! Usually when I'm trying to paint it's either cloudy without a breath of wind and the gnats are swarming me like flies on crap or it's sunny and the horseflies are buzzing me looking for an opening so they can swoop in and take a chunk out of my flesh. I must be tasty. Obviously none of this has anything at all to do with the whales I'm supposed to be writing about, but that's the way my mind works. Anyway, the whales. 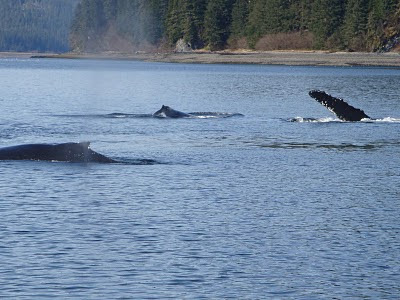 When the boys and I were halibut fishing we ran up past the Narrows in Port Frederick and could see four or five Humpbacks working the area. There were quite a few porpoises and birds too. I think all the little herring that had been in the harbor moved on up into the bay. Dummies! They should have stayed in the harbor where they were safe. I read somewhere just how much one of these whales eats and it's substantial. It's a wonder that there are any herring left at all, but somehow enough manage to survive to keep the species going. Even though I see them all the time, it's still fun to watch a group of whales work when I've got the time. Usually I'm running out to the fishing grounds and can't take the time to appreciate them. Sometimes there are so many hanging out in an area that they are hard to avoid. One of the local fishermen is in trouble for "harassing the whales" out by Point Adolphus. It's a ridiculous charge and I hope he can get it thrown out. He was on his way out to the ocean and got too close to a whale according to the Feds. Like I said, there are so many it's hard to stay away from them. While you're trying to steer around one, another one will come up right in front of you. It's pretty scary actually. 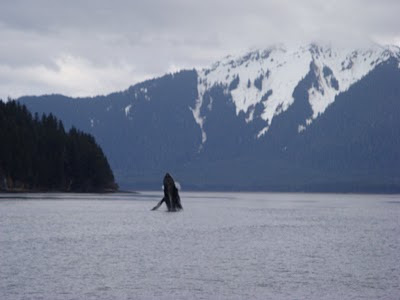 An encounter between a Humpback and a wooden troller wouldn't be very good for either party. However, on the day we were fishing, we were able to keep our distance. 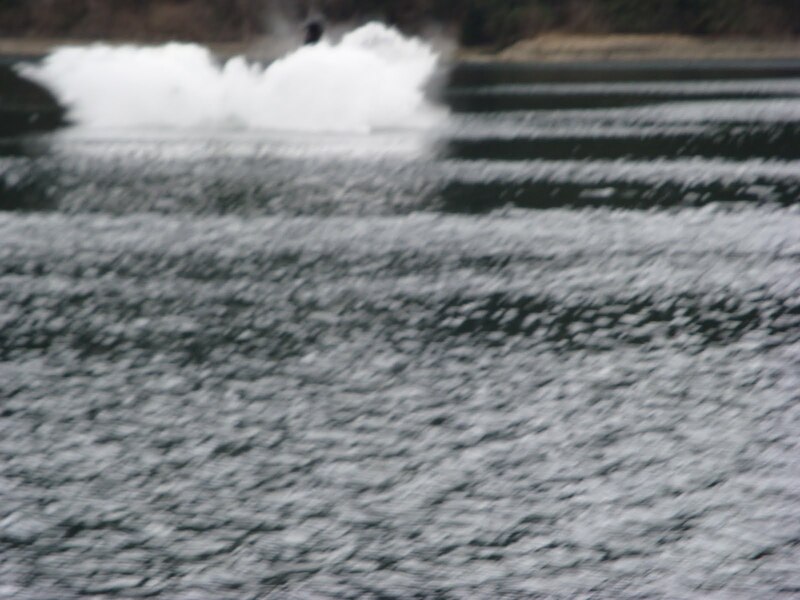 One of them decided to start jumping out of the water (breeching). He probably jumped six or eight times and I was able to capture it. As you can see, they leave quite a spash. There is an entire tourist industry built around whale watching and I've thought about getting into it myself, but my boat is too slow and I don't want to give up fishing yet. Some day though, when it becomes more of a hassle than I want to put up with, I may resort to running tourists around so they can enjoy for a premium what we enjoy for free.